Our Controlled Strain™ gasket is designed in principle to act as part o-ring and part lip seal but in the context of a gasket. It is an ideal design for sealing surface pockets (e.g. hydraulic manifold surface) or ports subject to any range of pressure. The rubber bead is deformed when in contact with a mating surface. Displacement of the bead is controlled by the concave groove in which it is situated. Contact with the mating surface causes the bead to collapse and assume a "mushroom-like" profile as opposed to its initial semicircular profile. By containing the displacement of the bead we effectively control the induced strain. Fluid pressure against the collapsed bead urges it against the mating surface thereby increasing the efficacy of the seal. FastDash ™ is a trademark of Seals Eastern, Inc.; OringOnline ® is a registered trademark of Seals Eastern, Inc.; 7182 ™ is a trademark of Seals Eastern, Inc.; AFLAS ® is a registered trademark of Asahi Glass Co., Ltd.; Viton ® is a registered trademark of Dupont Performance Elastomers, LLC. 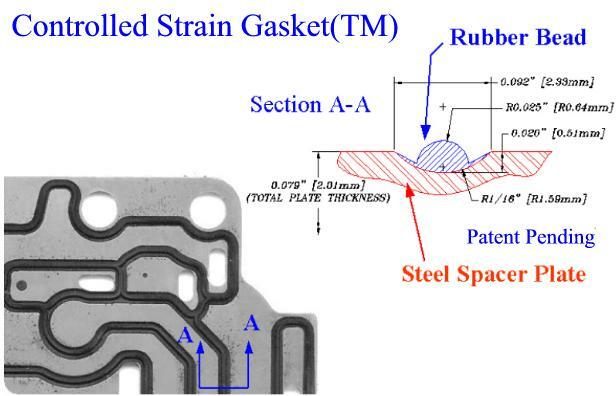 ; Controlled Strain Gasket is a trademark of Seals Eastern, Inc.